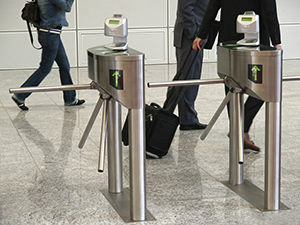 Collect employee and visitor data at entry turnstiles. OnBoard has an extensive set of interfaces and integrations that drive workplace management from the perspective of how people collaborate and engage with work. OnBoard is accessible through many interfaces, and with no expensive, proprietary hardware, users have the ability to choose how they use the software whether it’s through the company intranet, Microsoft Exchange integration or a mobile device. OnBoard integrates seamlessly with modern, corporate infrastructure systems to offer comprehensive support for catering and AV equipment, automated phone switching, real-time badging and access control systems, smart building technology systems and full integration with Human Resources systems. Full enterprise-level reservation system managed from within Microsoft Outlook. Reserve meeting rooms and order contract food service, catering and workplace hospitality all from one system. One-touch interactive digital signage for reservation-less or hot desking environments but still provides critical utilization data. View room status and availability on a non-interactive displays located at a resource (conference room or workspace). Powerful, location-based reservation management on iPhone and Android devices. Blackberry and Windows phone support with OnBoard Scout. e-Ink based digital signage to display status and reservation information on desks and in meeting rooms. Web-based user interface powered by “smart” software designed to include the needs of ADA/508 users. Provides a complete, end-user interface to make, manage and check-in to reservations via standard web browsers. Shows floorplans, resource availability, and reservation status on standard large screen televisions and monitors. Turns your existing Cisco VoIP phones into fully functional check-in devices for hoteling and conference room management. Windows-based interface for fast check-ins and reservations on self-standing kiosks and wall-mounted touchscreens in entryways and common areas.